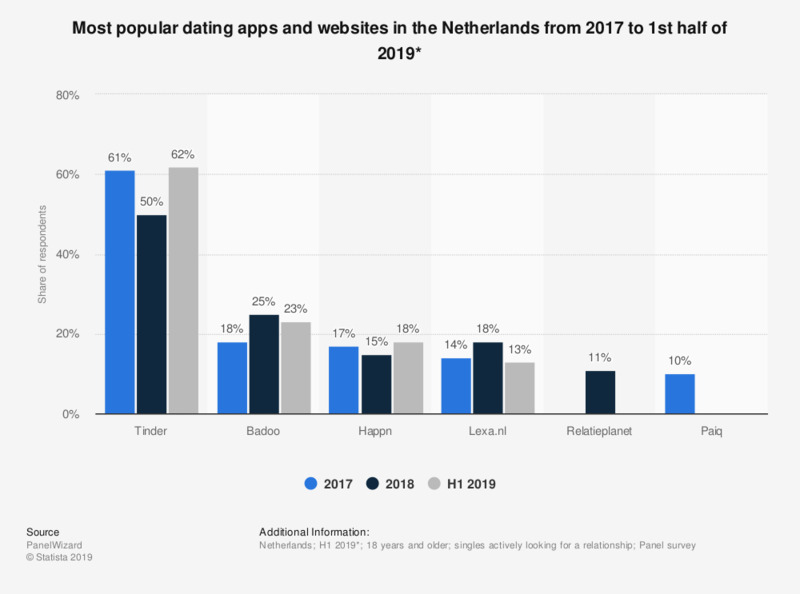 This statistic shows the results of a survey asking for the most popular dating apps in the Netherlands in 2018. The companies behind the dating apps rarely share user numbers on the Netherlands specifically, so most data on this topic comes from individual surveys. As of 2018, Tinder is the most popular dating app, with roughly 50 percent of the Dutch singles who are actively looking for a relationship indicating that they make use of it. Badoo and dating website Lexa are also used. When asked during a 2017-survey which dating app singles would consider using if they were to date online, roughly one quarter answered they would consider using Tinder. This was especially the case among people under 30. * The source does not specify the exact date of the survey, the number of respondents or the research method. Additionally, there is no mention of multiple answering options.